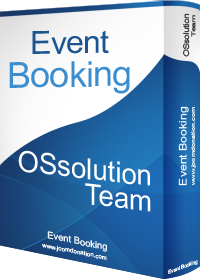 Events Booking is a Joomla 1.5, Joomla 1.6, Joomla 1.7 and Joomla 2.5 Event Registration extension developed by Ossolution Team . It allows you to created events (both free and paid), allows registrants to register for these events (Individual or Group registration) and process payment via online payment gateways such as : Paypal, Authorize.net, Eway, WorldPay and Offline Payment gateway. Note : Paypal Pro, 2Checkout, Authorize.net SIM (Server integration method) ,Google Checkout, First Data, iDEAL Mollie, Moneybookers, Alertpay,DPS Px Pay, NAB Transact, MIGS: MasterCard Internet Gateway Service (Australia), Paytrace payment gateway are released as Payment Plugins . Please click on Payments Plugins menu item to see more information . Nested categories: Events Booking allows you to organize your events cross infinite categories and subcategories. Events management : Events Booking allows you to create and manage events from back-end of your site . You can create both free event and paid events . Users will be able to browse for events and register themselves for this event from front-end . From version 1.2.0, you can also create recurring (daily, monthly, weekly recurring) events . Front-end events submission: Event Booking allows users (with right permission) to submit events from front-end of your site. From version 1.5.1, you can also allow users to submit locations and choose these locations for their events in the front-end as well. Free and Paid event support: You can create both free or paid events. For paid events, registrants can pay for it via Online Payment gateway: Paypay, Authorize.net, Eway…. Collect registrants information: Event Booking allows you to collect information of registrants (both individual and group registration ) when they register for your events. You can collect basic information (first name, last name,…..) and any information you want using custom fields. You can change settings to show/hide, make required/not required any fields on registration form. Group and Individual Registration support: Users can register for an event by individual or for an group . For group registration, users will be able enter necessary information of all members in the group. Furthermore, with group rate setting for each event, you will be able to give discount for group registration . Shopping Cart (added from version 1.3.0) option: This feature allows registrant to choose register for serveral events within one checkout. It works much like a shopping cart system. Deposit payment : Event Booking allows you to setup deposit payment for each event. That means if you setup deposit amount for an event (for example, 50%), users will pay 50% total registration fee when they register for event and the remaining when they come to attend the event. Multi-payment gateways support: Events Booking has Paypal, Authorize.net, Eway, Worldpay and Offline payment plugins come with it by default. Other payment plugins like Paypal Pro, 2Checkout, Google Checkout, First Data... are released as separate payment plugins. You can see them at Events Booking Payment Plugins . Coupon code support : You can create coupon codes from back-end of the extension and send these coupon codes to your customers so that they get discount while registering for your events. Coupon code can give discount by amount or by percent of total registration cost, can be used for one specify event or for all events. Captcha support : Captcha can be used on free, paid or both free and paid events (to prevent spam). Tax support : Event Booking is now allow you to setup tax rate for events. Emails notification system allows sending confirmation email to registrants and notification emails to administrators when someone register for events from front-end. The email messages can be edited from Configuration using Joomla HTML editor. Registrants management : Event Booking allows you to manage all the registrants from back-end of your site. You can create new, view, edit, or delete registrants. You can also export registrants into CSV format and view it is MS Office program . From version 1.2.0, you can also give permissions for some special users to be able to manage registrants from front-end (to prevent them to access to back-end of your site). Theses users can also use CSV export featue to export registrants of an event to a CSV file. Registration History : Registrants can login to his account to see registration history and modify registration information if needed. Event Custom fields allow you to create custom fields (defined via an XML file) to display extra information about the event (beside basic information like title, price, event date....). Mass Mail : With Mass Mail feature, you can send email to all registrants of an event from back-end of the extension (without having to use a newsletter extension). Waiting List feature : If you set this feature on, when an event is full, users will be able to enter information to join waiting list. If someone cancel their registration, admin can then email users from waiting list so that they can come and register for the event. Prevent duplicate registration : This option allows preventing a user register for the same event twice (can be turned on/off from configuration). Cancel registration : If administrator enable this features, registrants can cancel their registration before a certain date. Auto reminder feature : Event Booking allows you to setup the reminder feature so that registrants are reminded about the event before X-days the event occurs . Powerful custom fields feature: Event Booking allows you create custom fields to collect information of registrants (for both individual registration and group members information) . There is an interesting feature called Custom Field Fee which allow dynamic calculation total price for event registration based on the options which registrants choose during registration. Compatible with sh404: In version 1.4.2, we released sh404 plugin for the extension. Now, if you are using sh404 on your site, you will have nicer, SEF urls in Event Booking. Social sharing: Integrating facebook like buttons and other buttons to enhance social sharing. Users can share the events with other users on social sites. By this way, your events are more popular and can be visited by many other users . Search pluginsto allows events to be seachable via Joomla standard search. Content plugin to display event detail within Joomla article. Content plugin to display individual registration form of an event within a Joomla article. Locations management: Event Booking allows you to create and manage locations of events . When users view an event from front-end, they can see location information, see this location on google map and get direction to this location using google map. Multi-languages support: Event Booking is designed to support multi-languages. Administrator can find and modify any language strings from back-end of the extension and translate it to any languages. Google Map integration: Event Booking is integrated with Google map to allow registrants to view locations of events on the map. Plugin enabled system: Events Booking allow you to write plugins to extend the funtions of the extension . New sletter integration: Events Booking integrate with popular newsletter extensions CC Newsletters, Acajoom Newsletters, AcyMailing Newsletters. It allows suscribe registrants into newsletter system so that you can send newsletter to them whenever you want . Joomla(TM) 1.5 native, follow MVC programming model, on–going development and great support . This is just the first version of the extension, we will continue working on it, adding more and more features to the extension. Excellent. Affordable. Reliable Customer Service. We all look at these reviews to decide whether to put our money into commercial joomla products. Well, you've come to the right extension if you are seeking an event booking system to receive payments from registration. It's worth the small investment. I recently had the developer, Tuan, customize the component to add a DEPOSIT functionality. I believe they might be including that in the next upcoming version. This way we can receive a percentage or set amount by paypal, then "at the door" receive the remaining payment. Works perfect for workshop, retreat, class registration. Like all things, some extensions might have the occasional bug, but you don't have to worry about your concern or issue going unanswered. Tuan has always responded to my questions in the forum with a solution. So, not only are you getting an excellent product that does what it actually promises, you also will get reliable customer/technical support in any case you need help, additional customization. Ossolution also listens to you. If you have feature requests they actually incorporate the useful ones. Excellent product. Affordable pricing. Reliable service. Stop searching for other event booking systems, you've found the right one already. Excellent Extension and Support - Tuan Rocks! Best In It's Class!!! This is the extension you MUST have for all of your event registration needs. There is little that this component can't do and what id doesn't, Tuan will make it so. My client needed a certain function that wasn't available and Tuan just indicated that the request would be handled quickly. In no time, Tuan was able to add the functionality my client needed and he is very happy. Tuan is in a small class of excellent and responsive Joomla developers that create great product for the community at a very reasonable price and provides immediate customer service! 10 stars!!! I have never left a review before but this extension is great. Had a small issue and the developer fixed it for me on the spot! If you need an event registration component...look no further! Great extension with a lot of flexibility and awesome support. The developer will work directly with you and is very knowledgeable about Joomla and all it's components. Would recommend to anyone especially at the competitive price! the best solution for event booking!!! we very happy that we find this component. big thanks to tuan for his quick and excellent service including all the customization he did for us. we will definitely love to work with with you guys again. This is an awesome extension that enable me to deliver exactly what the client wanted. One of the best extension I've used in a long time. The registration process is seemless and intuitive for users. Great work guys! One of the best extensions for Joomla without doubt. It is easy to use, offers lots of functionality, the code is written well, support is very good and has a very good value for money. This extension has a calendar view option, which you won't find in other event booking extensions. Wow!!!!! It's not very often that you get great extension and a great support. Developer is always easily accessible via Skype and always responds within seconds. Very easy to use and the perfect solution for my application. Can't wait for new features. No doubts, this is an excellent Event Booking component for Joomla! Easy to configure, easy to customize and everything works as expected. Even the design that goes with the component is great! Still though, if you need to change the look and feel of it, it is very easy to customize. We are really satisfied with this purchase! It supports both free and paid events, the administrative part of the component is well organized so you can change settings with ease. Lots of useful features and as we understand from Tuan, they are planning even more. The technical support is awesome! We needed a specific and urgent functionality to be implemented and Tuan was really supportive in this matter. from fantastic guy named Tuan. He provides you with fully working, highly polished components/products and Event Booking is great example of brilliant piece of work he puts into your business or social project. One of the best value for money products in its category. If you are looking for on-line booking system for a photography business or filmmakers events attendance list - you found what you need. Communication with Tuan, who supports you throughout the process of installation and configuration is on excellent level. You get access to mildly busy Forum with all the information you need to improve your extension. You receive updates with not only fixes but improvements! Every month you expect at least one new great feature for your product. And whats the best in this? You receive improvements tailored for your need for Free for Life. Excellent component, does exactly what it says. Great customer support. Highly recommend! This is, by no doubt, the best product/component that I've ever installed on a joomla site. The componenet is amazing, and is by far the best componenet for a event/booking system - and believe me, I've tried ALL of them. The support is amazingly fast. They reply right away, and always ready to help with your specific needs. I had some specific complex requirements (in addition to the standard features) and they worked it out withing 24 hours! It's so flexible, and it gives you EVERYthing you need in order to have an event, calender and a booking system. Its a 100% allround which makes the work extremly easy for you. The best part is, that this product is so cheap, and you can install it on all the joomla installations you need. This is the best joomla-purchase i've ever made. Excellent Events Component and Tuan gave FANTASTIC SUPPORT!!! I asked my client to buy this extension as it looked very promising from the reviews here and from the demo site. While I was started working on the site, I had some issues come up with this component. I immediately got on the joomdonation forum where I could find the developers ( Tuan ) Skype ID. I got on Skype and I was so lucky that Tuan was online as well. He immediately sent me the updated files and all my questions and troubles were sorted out instantly!! I can't Thank Tuan enough, this is what I call first class customer service and I will in no doubt be recommending Joomla Extensions from JOOMDONATION. Tuan Thank you so much again! You've just earned a client for life! I am so grateful to Ossolution for this marvelous component. And more particularly, I am incredibly impressed with the support I received. Thank you so much for helping me be a hero to my staff by making this event booking component available on our site. Mary in Nebraska. Really easy to use and great support from Tuan. Plus it looks good! As many others, I find both - the product and customer support just BRILLIANT! Because of some design requirements from my client, they didn't match initially but Tuan had it sorted in no time! Thanks Tuan and Ossolution Team! I have conducted about 100 seminars in Australia and use to used my own custom forms to accept the online booking. I wish I had of know about this extension at that time. I now have the need to run seminars and have sought a more simple and professional online booking function.